Amy Frost sent this photograph in. "Hello! 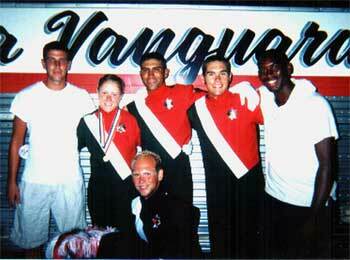 This is a picture of myself and a few other members from the 2003 Santa Clara Vanguard. It was taken finals night after we had returned to our housing site. From the left: Andy Schwartz, me, Nick Rodriguez, Kris Quaale, Ashley Donaldson, and on the bottom is Stuart Shulman, one of our drum majors. "Ashley Donaldson had marched 2000 to 2002 and was on the visual staff. Andy and Nick aged out this past summer, Nick was in his fifth year with Vanguard and Andy was in his second. "Nick was our horn sergeant! He did a great job. This was my first year with Vanguard, as well as Kris.' And Stuart, well, who doesn't know Stuart Shulman? It was his third year in Vanguard, and his second year as drum major. "I wanted to submit this picture because I want to show everyone who is interested in marching drum corps one of the major plus sides of marching: Long-lasting friendships." Thanks Amy!